Around 1650, the first Roman Catholic Settlement in Virginia was established by Giles Brent and his sisters Mary and Margaret Brent near Aquia Creek in Stafford. The Brent family was wealthy, and were distant cousins to Lord Baltimore, founder of the Maryland colony. Lord Baltimore intended Maryland to be a place of religious tolerance, where Protestants and Catholics could live together peaceably. By encouraging the Brents to move there, through promises of land, he was trying to further this experiment. Margaret and her sister remained unmarried, despite the tremendous pressure at the time to do so. Men outnumbered women six to one, so they would have been pushed hard to marry (Carr). Because she was unmarried, Margaret was able to own land and conduct her own business in Maryland. Margaret Brent is most famous for appearing before the Maryland assembly and demanding to vote on January 21, 1648. Her reasons for wanting to vote included her ownership of land and that she was also a legal representative for Lord Baltimore. She was refused, but it is unlikely that she expected to be granted the vote in the first place (Carr). There was already a Spanish missionary settlement established near Aquia, in Stafford County. The Brents bought and established two plantations called Peace and Retirement. In 1785 the site had a population of nearly 200 Catholics. It was not until Thomas Jefferson established the Statute of Religious Freedom that Catholicism began to flourish in America (MacDonnel). The nearby Catholic parish of St. William of York claim ancestry through this first Roman Catholic Settlement (Lagan). The site near the marker has an elaborate crucifix statue designed by Georg J. Lober. 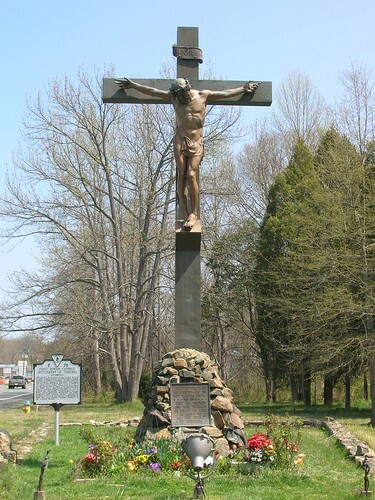 It was erected in 1930 and stands on Rt 1 in Stafford near Aquia. “Crucifix,” Courtesy of Amy Benjamin, 2008. “Margaret Brent,” http://www.historyswomen.com/1stWomen/MargaretBrent.htm (accessed April 15, 2008). Carr, Lois Green. “Margaret Brent: a Brief History.” Historic St. Mary’s City Commission. http://www.msa.md.gov/msa/speccol/sc3500/sc3520/002100/002177/html/mbrent2.html (accessed March 27, 2008). Goolrick, John T. The Story of Stafford: A Narrative History of Stafford County, Virginia. Fredericksburg, VA: The Fredericksburg Press, 1976. Lagan, Irene. “St. William of York Parish Rooted in Family History.” (Arlington, VA) Arlington Catholic Herald, January 23, 2003 http://www.catholicherald.com/parish%20profiles/wmyork.htm (accessed 27 March 2008). MacDonnel, Claire. “Bloody Beginning for Catholics in Virginia.” (Arlington, VA) Arlington Catholic Herald, 1999 http://www.catholicherald.com/articles/00articles/history25.htm (accessed 27 March 2008). This entry was posted in 1600s, Early Settlement, Jennifer, Stafford and tagged Aquia Landing, Giles Brent, Lord Baltimore, Margaret Brent, Stafford on March 10, 2008 by jlfeldhaus.